Until tonight, little news was released following last night’s destruction of the Orb-3 launch from the Mid-Atlantic Regional Spaceport at Wallops Island, VA. I can’t say that I was surprised, as they must have spent the entire day assessing damage, collecting debris, and just starting to make sense of what happened before they released a statement. The overall findings indicate the major elements of the launch complex infrastructure, such as the pad and fuel tanks, avoided serious damage, although some repairs will be necessary. However, until the facility is inspected in greater detail in the coming days, the full extent of necessary repairs or how long they will take to accomplish will not be known. Mind you, this is still very early in the investigation. 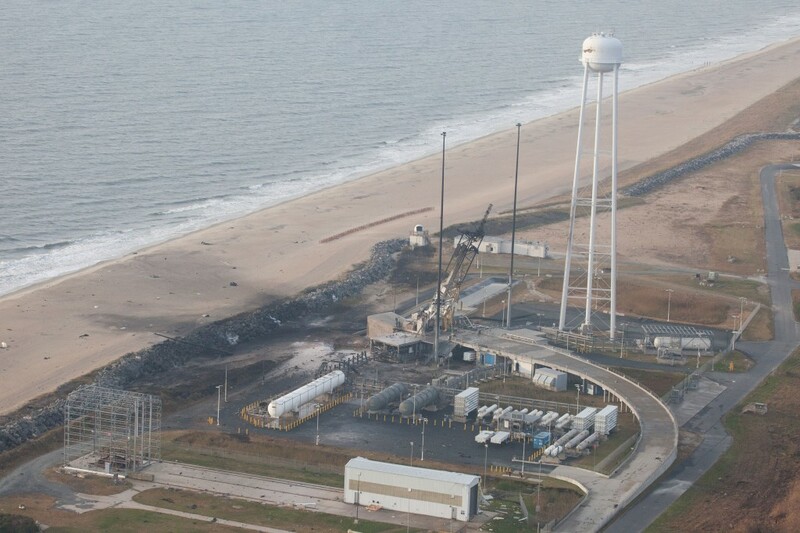 It’s going to be months before there’s another rocket launch out of Wallops, to the space station or anywhere else. But we’ll take the encouraging news as we get it. By now you’ve probably heard that the Antares rocket carrying the Orb-3 resupply ship to the International Space Station exploded shortly after liftoff. Details are coming in fast and furious and I’ll have more to say as the facts trickle in. What follows is my own personal account and some thoughts on tonight’s events. I was on top of the roof of Smith Hall at Towson University with four of my physics students. We were looking toward the southeast, toward NASA’s Wallops Flight Facility in Virginia, hoping to catch a glimpse of the Antares Rocket on its flight to the International Space Station. Although I had NASA TV playing on my iPhone, our eyes were trained on the horizon. In my experience I’ve found that NASA TV is anywhere from 30 to 60 seconds delayed. So we started scrutinizing the horizon as soon as the clock read 6:22 pm. By my guess, we should see the rocket emerge from the horizon even as we were listening to the final countdown play out on the phone. I’ll spare what I said next, but suffice to say it was not the sort of thing a professor would normally say in front of his students. Realizing there wasn’t going to be a rocket rising over the horizon, we went downstairs to the classroom. I put NASA TV on as the students filed in for the class that was to begin at 7pm. I had given my students the “homework” assignment of trying to spot the rocket’s flight over the horizon; a timely assignment as we had discussed the physics of rockets and space flight last week. I started class by filling them in on what had happened. I explained what little we knew and what we didn’t yet know. Needles to say, there were a lot of questions: Was there anyone on-board? Was anyone near the launch pad? Will they be able to launch from there again? Will the astronauts aboard the International Space Station have enough food? Thankfully, I could answer the most important question — nobody was on-board the spacecraft, nor was anyone anywhere near the launch pad. 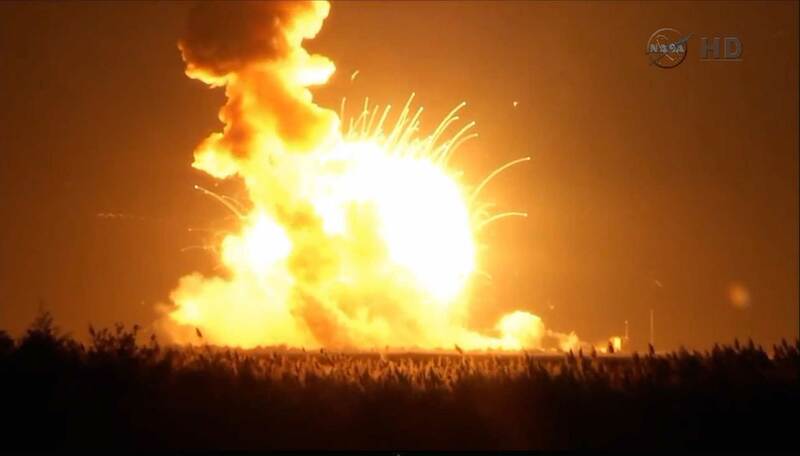 In fact, NASA was reporting that all personnel were safe and accounted for. Thank goodness. The students got to see a perspective of spaceflight that they probably hadn’t considered before — this stuff is difficult, challenging, and dangerous. Rockets have to unleash a tremendous amount of fuel as fast and with as much energy as possible. Only then can the spacecraft accelerate forward in reaction to the controlled explosion raging underneath it. It’s a lot harder than it looks. After I got home, I watched the news conference and shared some reactions on Twitter and Facebook. A lot of people are upset tonight and understandably so. Many man-years of hard work and effort were lost tonight, including the spacecraft, the rocket, and most of an entire launch complex. But now the investigation is underway. It’s tempting to speculate what might have been the cause, but I’ll refrain from doing so here. There is a lot of data that will need to be examined, including telemetry, video, and even the scrap paper used by the launch team. And then there’s the physical debris that will need to be collected and scrutinized. There’s nothing routine about spaceflight. Update 27 October 2014, 6:47 pm EDT: Launch is scrubbed due to a boat in the exclusion zone in the Atlantic ocean to the East of the Launch pad. They’ll try again for a new 6:19 6:22 PM EDT launch time on Tuesday, October 28. I hate launch-stopping boaters. Update 27 October 2014, 3:00 pm EDT: Come for the launch, stay for the station! I forgot to mention that since this is a nighttime launch to the International Space Station, the station itself will pass overhead around these parts. 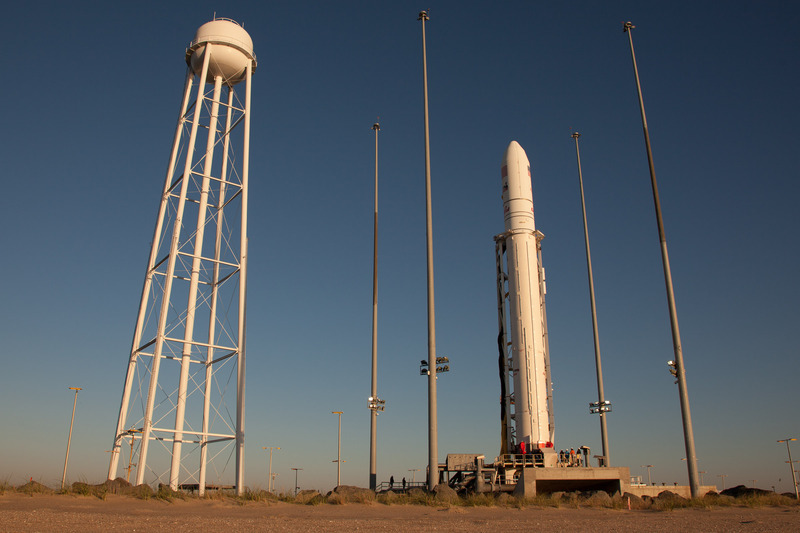 Here in Maryland, the station will rise in the Northwestern sky at 6:49 pm EDT, fly overhead, and set in the Southeastern sky about 6 minutes later. Visit NASA’s Spot the Station website to find out where to look for ISS in your neck of the woods. Orbital Sciences Corp are getting ready to launch another Antares rocket carrying a Cygnus resupply ship to the International Space Station. The spacecraft is on-board the rocket, the rocket is on the pad and, as of this writing, is 98% GO for Monday night’s launch out of NASA’s Wallops Flight Facility. Launch is scheduled for 6:45pm EDT. It’s looking like we’ll have clear skies here in Maryland and should be in for a pretty good show. 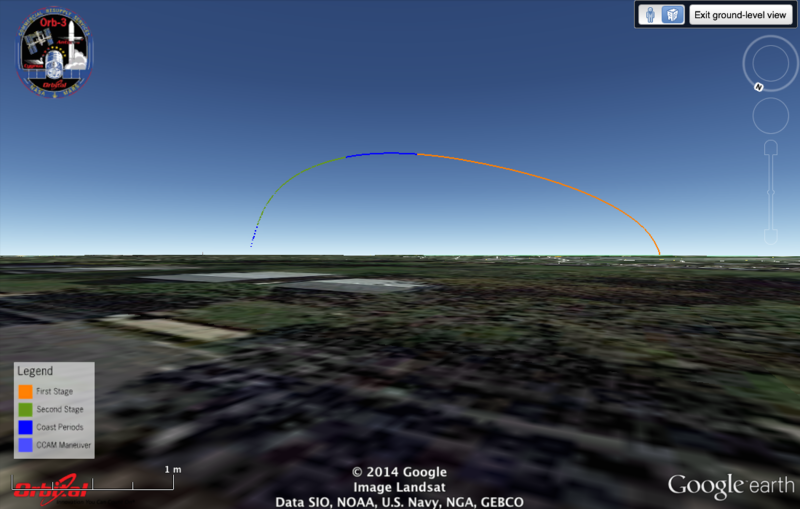 As always, NASA and Orbital have provided some viewing guides to help you spot the launch. 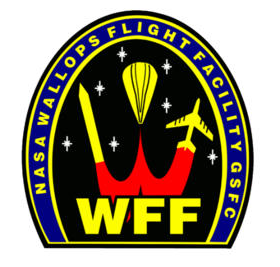 An even better resource is to get What’s Up at Wallops mobile app which will point you in the direction towards the launch pad at Wallops. The app is available for Android and Apple iOS. 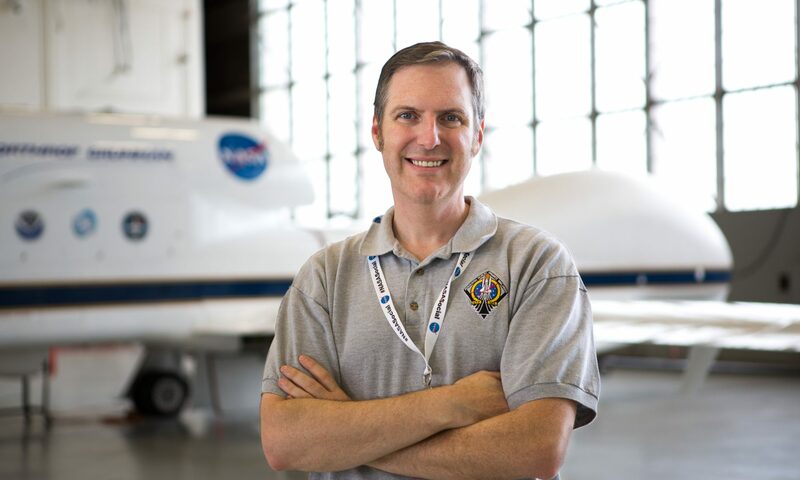 While you’re at it, be sure to get the free NASA TV apps for Android and Apple iOS as well. Use these apps to monitor the countdown while you’re heading outside to look. Bear in mind that the streaming to your phone is usually delayed by up to a full minute so don’t count on it for true “real-time” information. 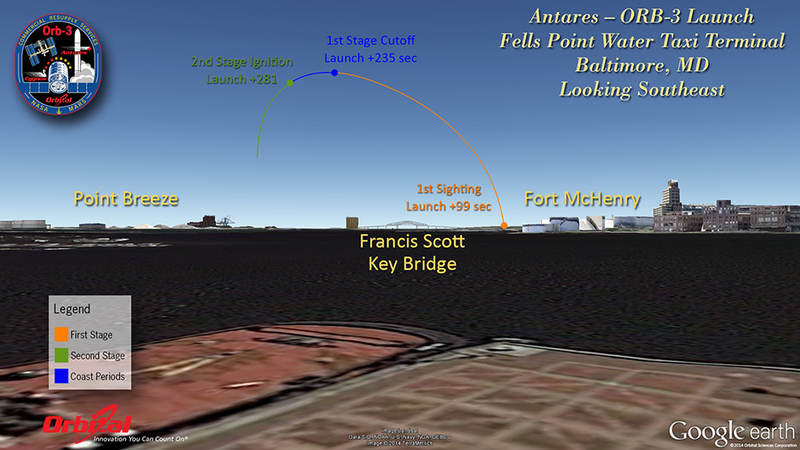 What the Antares launch will look like from Fells Point in Baltimore, MD. 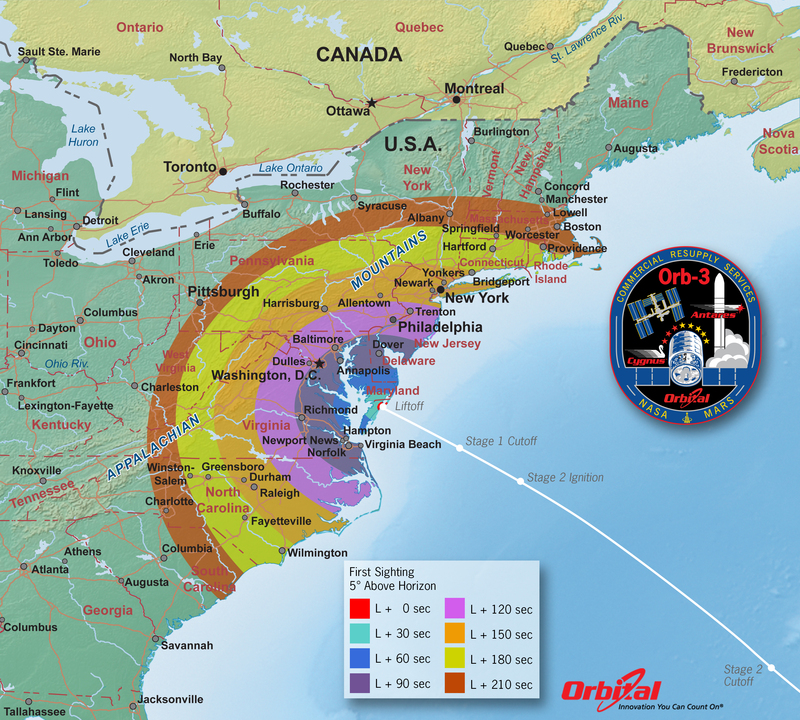 Credit: Orbital Sciences Corp.
Orbital Sciences Corp have some additional viewing maps for Orb-3 that show simulated views from Washington DC, Delaware, and Virginia. 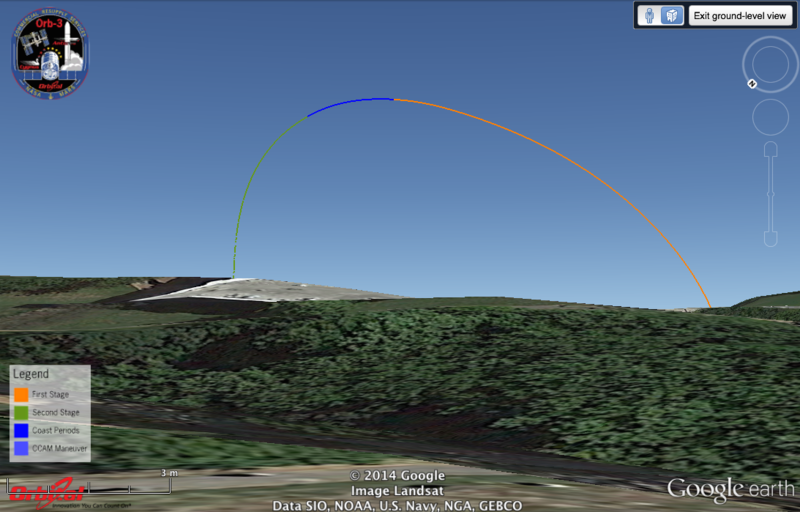 If you have Google Earth, you can download the .kmz file and view the launch path from your location. For some viewing tips, I’ll refer you to a previous post of a similar ISS resupply mission. Good luck and Go Antares/Cygnus! Magnificent, isn’t it? With a vast wasteland before her, a young apprentice forms planets out of the rock and delivers water to them via comets. The result is a spectacular allegory of how water was delivered to Earth billions of years ago (albeit without the need for a creator to do so). And all of this is taking place as the Rosetta spacecraft prepares to land a probe on Comet 67P/Churyumov-Gerasimenko on November 12th. The actual campaign idea is very well targeted. But, shooting myself in the foot a bit, I’m very surprised you need something like this at all now. Mankind sends a probe into space to catch a comet and land on it, and we need a great director, film, and actors to convince people this is interesting. Alas, that seems to be true. Nevertheless, the film is as amazing as the Rosetta mission is ambitious. And yes, that is the guy that plays “Littlefinger” Baelish from Game of Thrones. Astronomer, Educator, Deadhead, Vegan. A little bit further than I've gone before.